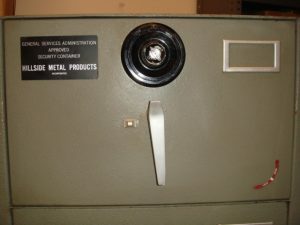 When containers or doors are repainted, they shall be painted one of the original approved colors (grey, black, or parchment); weapons containers and vault doors are only approved in gray. 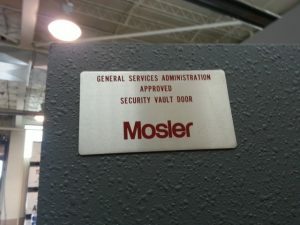 Mosler Maps and Plans Safe with malfuctioning Mosler MR302. 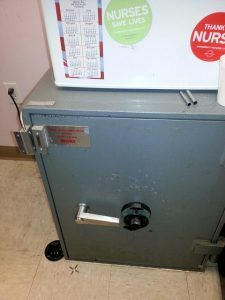 Safe Opened by Safetech Craig Toocheck. 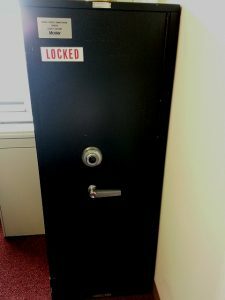 Hillside Metal Products GSA File Cabinet, with Lost Combination on the S&G8400 Series Comb Lock, Cracked by Craig Toocheck, GSA Safe Technician. Malfunctioning MAS HAMILTON X-07 on a Mosler Red Label. Safe Opening by GSA Safe Technician Craig Toocheck.